The Giro Trinity is plain and simply a helmet - in the manufacturer's own words. Benefitting from Giro's years of R&D, it's a classic design with modern features at a low price. The styling is a bit like a beefed up Atmos. 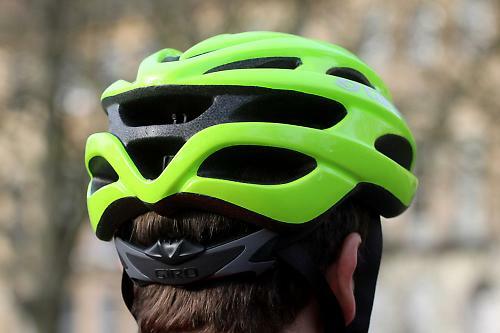 It's a clean circular shape with no flaring, presumably to keep moulding costs down, but it creates a helmet that isn't making a statement, simply providing head protection. Like most value helmets, it has fewer vent holes with larger spacing, which has the added bonus of making the helmet more solid. Fit for me was comfortable and a lot better than cheaper helmets that I have worn in the past. In fact, there wasn't a lot to distinguish it from helmets four times the price in this aspect. The fit is helped by borrowing from the premium helmets the Acu Dial system, a single dial you can adjust with one hand for tension around the head. It allows a fine step adjustment to minimise pressure points, and if it does feel too tight, that can be easily remedied on the bike. To hold the Trinity under your chin, Giro have used a ratchet clasp rather than simple clip. Again, this allows the chin strap to be easily adjusted whilst on the bike, without having to fiddle with the strap buckle. On the bike, the main differences you're going to notice are the venting and weight. As said, the vents are smaller and with greater spacing than you'll find on a performance helmet but with aero helmets being all the rage, perhaps that isn't as great a problem as I first thought; I had no problem. The weight is more noticeable as you move your head about, but you really only notice if you're used to a light, top-end helmet; we're talking about 60g here. Our test helmet came in high visibility yellow: perfect for commuting, which I think is this helmet's target market. If you don't fancy that, there are plenty of other colours but the yellow differentiates it from other helmets on the market. Helmets are like most items in cycling: cost/performance flattens out quickly and doesn't correlate with pounds/wowness factor. 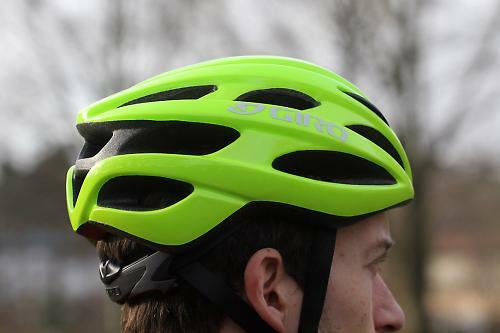 The Giro Trinity does just what it says on the tin; it's a utilitarian helmet. What's nice is that it also has the adjustability of Giro's premium range so is comfortable while providing inexpensive protection. 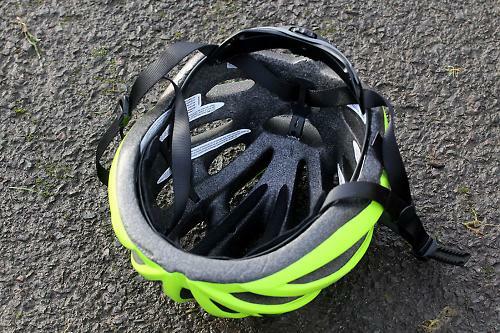 At an RRP of £40, there are cheaper helmets but perhaps not quite as tidy as the Trinity. If you're after a no frills helmet for commuting, or for a friend just getting into cycling, I'd go with the Trinity. "Sometimes the simplest designs are also the smartest. The Trinity™ is an easy fit for riders who want a classic cycling helmet that doesn't compromise comfort or performance. " It's a helmet and will protect your head like any other. Weighed in at 292g on my scales. By no means the lightest but surprisingly light for £40. I wasn't willing to perform a crash test I'm afraid but regulation would suggest it will be more than up to this. The high visibility yellow colour option and adjustability. It looks quite bulky on the head. Would you consider buying the product? Yes - for commuting, to partner my performance helmet. Looks good from the front... less finished off at the back. Lime green? not yellow. A Helmet. Funny, i thought the opposite!